I am admittedly not the best cook in the world. I try, I really do but no one is going to be offering me my own TV cooking show anytime soon. I really love being able to pull things together quickly, with quality ingredients and not with recipes that need 47 ingredients that I’ll never use again. I decided to try a recipe from KRAFT that while easy, was sort of out of my comfort zone ( I don’t make a lot of recipes with shrimp but I love eating it!). The first thing I did was head over to my nearest Safeway store (Vons for us here in Southern CA, where I use all the great Safeway Just For You deals) I headed on over to the cheese section and found something pretty neat. 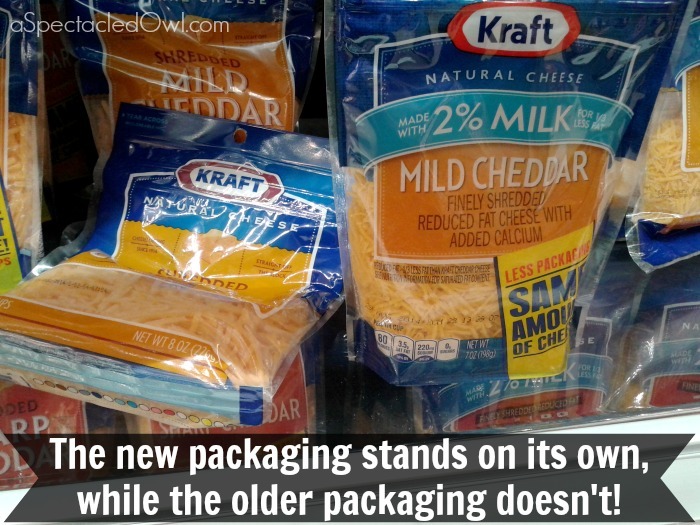 KRAFT has come out with new packaging! 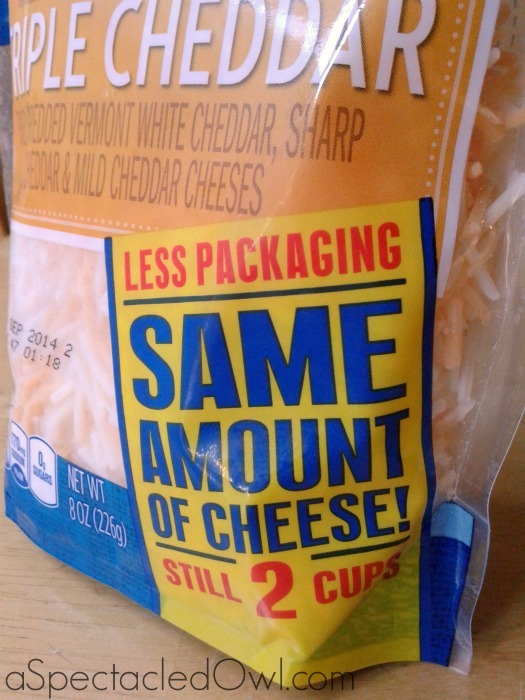 KRAFT Natural Cheese Stand-Up Pouch at Safeway stores has the same amount of cheese in the new packaging (2 cups) as before but now has less packaging and stands up on it’s own so it’s easier to scoop cheese out of the package or stick your hand in for the right amount of cheese for your food. Only one hand needed, which is perfect for when you’re cooking! When I’m making things like enchiladas and adding sauce, chicken, cheese, etc. to the tortillas, it’s always hard to have the cheese package falling over as I try to put my hand in to grab cheese for each enchilada. 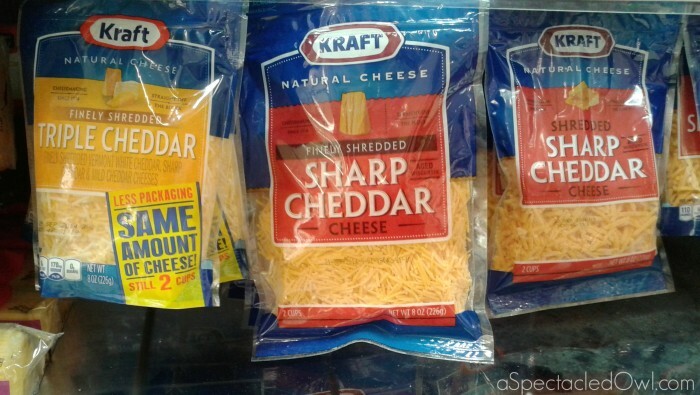 Now, I know I can grab some cheese from a KRAFT Natural Cheese Stand-Up Pouch & not make a mess, spilling cheese on the counter & wasting it! So, now onto our easy Kraft recipe! I chose to do the Cheddar-Shrimp Nachos. My husband & 15 year old son were really happy to be the guinea pigs for this one. We all loved this recipe and loved that we could put our own spin on it, like adding sour cream, salsa, more jalapenos, etc. These look great! My husband and I love nachos. He loves shrimp but I’m usually very hesitant about seafood….I might have to add some chicken to this recipe to be able to eat the shrimp. The cheese might be enough to get me through though 🙂 Thanks for sharing! These look absolutely delicious! Pinning it NOW to make it later!! Thanks for sharing! These sound like something my husband would love. Thank you for sharing this recipe with us.